Squash may not be the most popular sport — football takes the crown in the United States, while soccer is king throughout the rest of the world — but it still draws sizable crowds and generates considerable interest. Take the annual Motor City Open, hosted by the Birmingham Athletic Club every February. The tournament, which includes a $30,000 purse (up from $5,000 for the inaugural event in 1999) and a Rolex watch from Greenstone’s Fine Jewelry in Birmingham, draws 32 players from such distant locales as England, Spain, and Egypt. 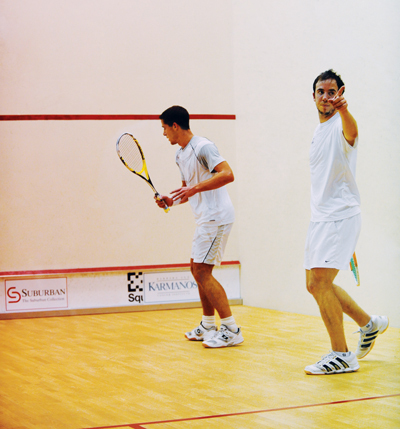 The club, founded in 1955, has 350 members, 200 of whom are active in squash. Located next to Oakland Hills Country Club, the BAC’s membership includes a broad spectrum of businesses, including insurance agencies, law firms, brokerage houses, and private-equity firms. “We’re another institution in the region that helps drive the economy,” says W. Scott Schilling, BAC president and sales director for STMicroelectronics Inc. in Livonia.